A CPAP is a therapeutic device that helps patients with Sleep Apnea to breathe effortlessly throughout the night. 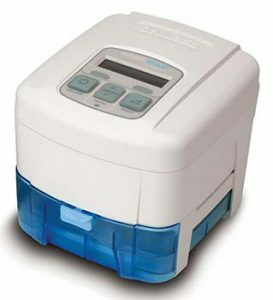 There are many top rated medical brands manufacturing CPAP devices, but each patient needs to shop around carefully and look out for all important features and benefits of the machine they will purchase. After a sleep study, a doctor will be able to appoint to each patient the exact type of device they need, and the important features the machine needs to be equipped with and certain accessories they should consider. This is one of the newest CPAP devices made by Philips, already available on the market. This is an incredibly sleek, stylish and compact CPAP machine with user-friendly controls. The machine displays advanced therapy data right on the main screen, and this information can be easily downloaded via the SD card or even viewed directly on the DreamMapper application. DreamStation by Philips Respironics is an auto-adjusting device, which means it will adjust oxygen pressure to the changing breathing needs of the patient. Thus, optimum pressure is delivered to the airways, and the patient enjoys a restful night of sleep. With advanced event detection, the machine will maintain the lower pressure prescribed and then increase pressure to support the airways and prevent obstructions. Patients can equip their machine with a heated humidifier and a heated tube to receive optimal temperature air into the passageways and to minimize rainout. Some of the advanced features include SmartRamp to help fall asleep on a gentle pressure, Advanced Data display, Mask Fit check to prevent leaks, Auto On/Off and Bluetooth Connectivity incorporated. 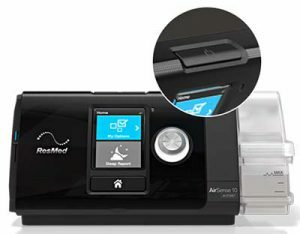 ResMed designed yet another premium category CPAP machine to assist patients with breathing difficulties receiving the comfort and peace of mind they need. This is an auto-adjusting therapeutic device, which means it will adapt the pressure to the breathing waveform of the patient. It incorporates Bluetooth connectivity, AutoRamp feature + sleep onset detection, EPR-Expiratory Pressure Relief, and Easy-Breathe technology. The AirSense 10 AutoSet by Resmed is even capable of detecting complex central sleep apnea events and also Cheyne-Stokes respiration. Patients can also use the incorporated pulse oximeter for even more precise therapeutic tracking.  AutoSet Response Algorithm- custom tailored therapy to meet the needs of each patient. The machine delivers a gentle increase in pressure for more comfort at the onset of the sleep phase. If you like to travel a lot and you’re looking for a convenient and compact CPAP machine the Resmed AirMini is the right choice for you. It weighs less than a pound and can fit in a larger pocket or a small handbag. It’s fitted with the most modern technologies like HumidX and Active Air. The AirMini also has a dedicated smartphone app which can help with different therapy tracking utilities. The CPAP machine is very quiet and features trusted air pressure algorithms similar to the ones offered in the Airsense 10. This small device can turn into your travel partner and you’ll forget about the hassle of dragging large machines with your luggage. The machine is compatible with the following masks: F20, N20 series and AirFit P 10. You can find more information in the link below. One of the best CPAP machine as rated by users. This is an extremely small and compact CPAP machine with many advanced technologies integrated. It represents the best choice for traveling, and a comfortable solution for home use. The C-Flex technology provides pressure relief upon the exhalation phase to offer maximum comfort during therapy. Similar to the more technologically advanced BiPAP machines, C-Flex technology assists in lowering the pressure upon exhalation to help the patient exhale against a much gentler pressure. The machine will turn back to higher, prescribed pressure upon the inhalation phase to ensure the patient receives the correct treatment. The RemStar Plus C-Flex allows users to connect all tubing at the back of the machine, thus making it more visually appealing. IntelliPAP is a fixed pressure CPAP with integrated SmartFlex technology. The SmartFlex is an expiratory pressure relief feature, which means the pressure will be reduced to be gentler upon exhalation. One of the biggest problems faced by CPAP users is that they have to breathe against the high pressure coming from the CPAP. Now, thanks to SmartFlex they can enjoy a restful night of sleep and be able to exhale against a soft and gentle pressure, while the machine reverses to the prescribed levels by the time inhalation begins. The Mask Alert is yet another helpful feature for patients who move a lot during their sleep. Whenever the mask is accidentally removed from the face, the machine will send an alert so that the patient can readjust it to receive proper treatment. The machine is also kept in place thanks to the smart slip-resistant pads. This helps to avoid accidental slips and falls of the machine from your night table. Active sleepers agree that IntelliPAP by DeVilbiss has everything it takes to help them get a restful night of sleep without worrying about anything. Certainly, these are just a few of the best CPAP machine suggestions, but there are many other highly valued devices that help patients receive top quality therapy. Talk to your physician to see which exact CPAP features would be most beneficial in your case. This way, you will be able to make a well-informed decision when shopping around for the best CPAP machine. If you want to learn about the 2018 top choices you can read our update article HERE. REMstar does have a humidifier, and is very intuitive. The mask has sensors that determine the level of humidity that will benefit the patient. That being said, the machine will ramp the humidity up if it determines that the patient will benefit from the air being more humid than just preventing your mouth from getting dry. I would like to correct a bit of what you have stated. 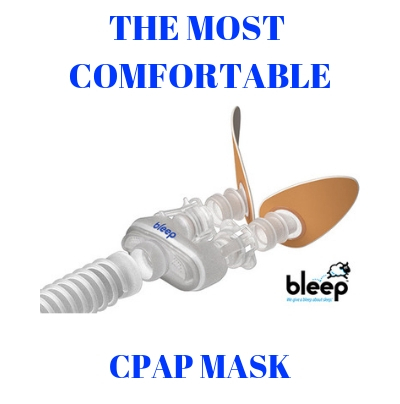 The CPAP mask does not have sensors to determine the level of humidity.That is a feature that is incorporated into the CPAP machine and a heated hose provides even more comfort. How much does this machine cost please. Does the price include the hose ? How much would a Philips mask cost. Thanks very much for your inputs. 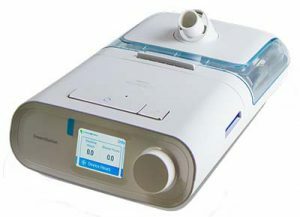 The RemStar series have been replaced by the Philips Respironics DreamStation CPAP series. Please call SleepRestfully.com toll free at (866) 923-2727 and we will assist you in determining which of the new Respironics DreamStation CPAP machines is correct for you. Tried the DreamStation Auto but it didn’t improve my sleep problem over my older cpap, so I am looking for a different one. I liked the details it showed on the screen but with no improvement in how I felt in the morning I don’t know if those figures were machine generated or actual !! I recommend avoiding the the DeVilbiss CPAP machine entirely. It is very poorly designed. Filling the humidifier reservoir is unnecessarily difficult, and always results in spilling. The small size requires filling it nightly. In a nutshell, this machine uses out of date technology, is poorly designed on top of it, and is difficult to use. Any other choice of CPAP manufacturer is my recommendation. Dear users. I have been using the Devil issue machine fore about 4 years now. Yes there are newer machines on the market now but other than having better technology like bluetooth connections and similar, the machine does what all the others do…..I find it is small enough for travel and reliable for every night use. I can’t comment on the ease of using the humidifier as I have never had the need to use it. It is ultra quiet and I have the auto set and breath easy technology so I get a great nite sleep. The only issues I have ever had have been with the masks. I would highly recommend the machine even by today’s standards. Do any of these auto cpap machines function with a battery as well? I’m concerned for power outages. We sell a lithium ion battery that will run your CPAP machine 2 nights. You will need to turn the CPAP heated humidifier off as it used to much power. I is also possible to connect two (2) batteries together to get up to 4 night of power. lease see the following link and call us toll free at (866) 923-2727 if you have questions. 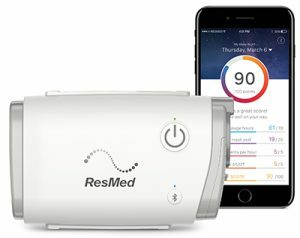 what is the best CPAP machine brand with all features critical to a restful night of sleep? Low and easy maintenance is preferable. LCD displaying therapeutic data required. Do I need a prescription from the doctor? I refuse once to start a sleep study in a lab but I prefer in my own home. Please reply asap before I order it right away. Thank you for your help. Marion The best way to get good information would be to call Sleep Restfully toll free at (866) 923-2727 and we can answer all your questions. Te give you a short answer. We believe the best CPAP equipment is from ResMed and Philips Respironics. We also strongly suggest you go with an auto machine as you will not need a sleep study and the auto CPAP will determine the pressure you need each time you have an apnic episode and deliver the correct treatment. Please call and we can help you get a CPAP machine and CPAP mask that will work for you. where are you.. what rates..
Our offices are located in Houston, Texas however we ship all over the United States and many countries outside the US. Please cal us toll free at (866) 923-2727 and we can assist you with price and anything else you may need. Thank you.